I meet a group of runners and race walkers once a week to work out together. One of the women in the group has the most interesting collection of t-shirts. One reason I look forward to my work out with this group is seeing what new shirt this woman has on each week. 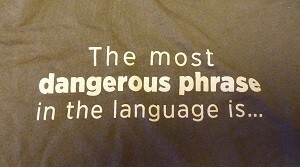 If you are in the computer programming field you will recognize this as a quote by Grace Hopper. The way we sit, stand, walk, eat, type, text is habitual. We become so accustomed to the ways in which we do things—we always stand with our weight into our right hip when we are waiting in line, we always text holding the phone in the right hand and with the right thumb—that it almost seems impossible that we can do the same things in a slightly different way. This plays out in some very comical ways. I passed a man the other day walking a black lab. He held the dog leash in his right hand. He held his cell phone with his left hand—up to his right ear! The whole thing looked very awkward. Now yes he might have been deaf in the left ear but I doubt it very much. Like the man with the cellphone, a lot of times you may not be doing something in the most efficient and easy way—but you get away with it. You don’t experience any major discomfort or problems. However, questioning how you are doing an activity becomes an especially important when things aren’t going well. A student of mine was dealing with some overuse issues in her right shoulder. Talking on her cellphone came up. It really hurt her at the moment to talk on the phone for any length of time and she didn’t have an earpiece (which might have been another way to go). I asked her to hold her cell phone in her left hand. I asked her to raise it up to her left ear. She said she couldn’t talk on the phone that way. I said sure you can. I asked her if there was something wrong with the hearing in her left ear. No, she said but she always held the phone up to her right ear. That’s’ just the way she always did it. It is very interesting how we will put up with a lot of discomfort before we are willing to start questioning how we are doing things. Because I am fascinated with movement and habits I am always noticing how I prefer to do things (my habit) and experimenting with doing differently. When I get dressed at the gym lately I notice how I habitually tend to put one leg in my pants first and so I’ll do differently and put the other leg in first. When I put my jacket on I habitually put my right arm in first and so I’ll do differently and put the left arm in first. This type of exercise then spills over into other areas of my life and I notice more often when I am doing something inefficiently (out of habit) and can choose to do differently. I always find that humor helps me when it comes to making improvement in myself. I think we can learn to take things seriously and yet still find humor within those things. This is great, Lauren! I decided to try mousing with my left hand years ago and it was one of the best “preserve your body” decisions I have made. People say to me all of the time “oh, so you are left handed” and nope, I just decided to mouse left handed–and usually they are curious enough to give it a try. After college a friend and I often sat across the table from each other with a big piece of paper and crayons. We would write and draw upside down and backwards “to each other” which was oddly relaxing–and also weird :). Thanks for the reminder to “mix it up” here and there. Thanks for sharing your experience of doing differently. I too mouse left handed but am right handed. The reason I started was because my shoulders don’t like it when my hands spend a lot of time too far outside the width of my shoulders. On most keyboards the number pad is attached to the right side of the keyboard. So if your keyboard is centered and you want to mouse with the right hand it has to be way over to the right beyond the number pad (and for me way outside the width of my shoulders). On the left side there is no number pad and my hand can stay within the width of my shoulders. My body is much happier when I mouse left handed. In the Alexander Technique world I think the most dangerous phrase would be “stand up straight”. Thanks for your comment. The almost universal instructions given to all of us as we have grown up to “stand up straight” or “sit up straight” have sent many people down a miserable path of pain and discomfort and set them up to have a poor relationship with what it means to have good posture. 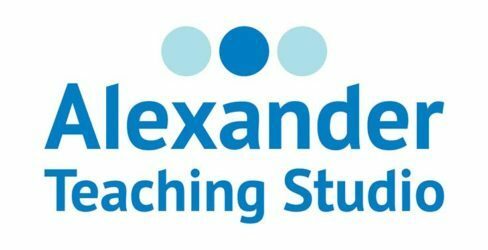 Doing differently in the Alexander Technique often starts with not standing or sitting up straight. Imagine that!